Pick a historical related film and analyse its historical accuracy. The historical accuracy of gladiator in some aspects was quite good but in others, quite bad. Even right from the opening scene, the inaccuracies start. 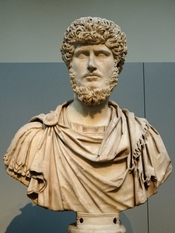 First, there was no last great battle with the Germanic tribes on the eve of Marcus Aurelius' death. There was a great daylong battle late in the campaigning season of A.D. 179, but Marcus died on March 17 of 180, just as he was about to launch another great military campaign. It is most probable that the scriptwriters needed to shorten the chronology here to save time in a long movie, but that wasn't their only mistake relating to battles. The use of fire-hurling catapults and mechanical dart launchers against the oncoming barbarians was certainly dramatic but probably unhistorical. Such weapons were too burdensome for use on the open battlefield, thus were confined to more static siege warfare. I have found no proof corresponding to the Roman commander Maximus, the movie's hero, and if there were one, it would not have been a German shepherd, a breed that did not exist in ancient times. 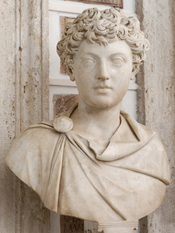 Bust of Marcus Aurelius (reign 161–180 CE). Marcus Aurelius was not quite 59 when he died, perhaps of plague. "Gladiator" does capture his kindly and philosophical nature, but his decrepit frailty, thin beard, and wispy fly-away hair in the movie bear little resemblance to his statues and portraits on coins. They show him as a fairly vigorous man with a full beard and a thick head of curly hair. WriteWork contributors. "Pick a historical related film and analyse its historical accuracy." WriteWork.com. WriteWork.com, 30 May, 2004. Web. 20 Apr. 2019.
yeah i know this isnt actually that good, i actually did this in year 9 for an elective course but accidently put it as year 10 as thats the year that i'm in now. So if you look at it that way, its not bad work for a year 9 guys now aint it?? i also didnt have a copy of the exact question so i wrote it from memory. The question involved a few more things which i completed and may still have stored away somewhere, if i have the time i'll put it all up here later. thanks for your reviews!! It was ok. You shouldn't or you should try to avoid using the word probably. It's asking for you to analyze the historical accuracy not your opinion. Haha...this is an interesting piece of work. I'm not sure why you bothered to research all this information but it certainlly does shed some light onto the background of the film. I thought the movies was truly billiant, and loved every moment, even after the 20 viewing. But some things you have to acknolodge, Hollywood scriptwriters have certain contraints on the time allowed in the film, and the intensity of the movie. I think gladiator worked so well because it cut out on the historically accurate bits but add drama to replace it. You see other historical films and they are rather boring, but Gladiator doesn't embrace history as its main source of the story, nor does it claim to be based on a true story. In short your arguement is true, but irrelavant. Excellent research used as proof for your thesis. Gave a very interesting and well needed look into the historical innacuracies of the film.